If you’re looking to make money in real estate but don’t want to hold onto a property for too long, then flipping is the best method of real estate investment for you. The basics of flipping a house are to buy a house that is undervalued or in need of an upgrade, perform the rehabilitation, and then sell it for more than you bought it for. This formula can be replicated over and over and is one of the best ways to make fast cash in real estate and build your wealth. The Flipping Blueprint is the perfect book for you to learn the methods of house flipping from experts that can teach you the entire process in easy to understand terms. 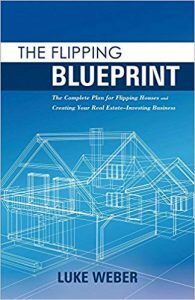 Everything that is contained in this book by Luke Weber is spelled out in the title, The Flipping Blueprint: The Complete Plan for Flipping Houses and Creating Your Real Estate-Investing Business. It contains the perfect blueprint from start to finish on how to flip a house and make a profit. Whether you are just beginning your real estate journey or have done some flipping before and just want to strengthen your strategy, you will be making a great investment in yourself and your success by reading this book. Ultimately, this book serves as a great guide for real estate investment in one of the most popular and easy to learn methods, flipping houses. This book demonstrates how to safely and securely manage the whole process, and can be replicated over and over in every deal that you find. The thing that I like the most about this book, compared to others (see all my reviewed books here: flippingmentors.com/real-estate-books), is that it outlines a very specific action plan to flip houses. It doesn’t gloss over anything or just gives the basics. I have attended many seminars and workshops on flipping houses and this book still taught me so many new things that were never brought up in those forums. It tells you what actions to take and when. There is a lot of meat to the chapters, so much that I found I had to go back and re-read from time to time to make sure I fully absorbed all of the information. I definitely keep this book in a prominent place on my bookshelf as it has become a valuable resource. I highly recommend it if you are at all interested in this kind of real estate investment!